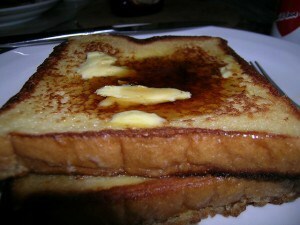 Instead of making your ordinary toast with butter or jelly why not try French toast. This French toast will give your taste buds a sweet kick for the morning and bring you a delightful and delicious breakfast. 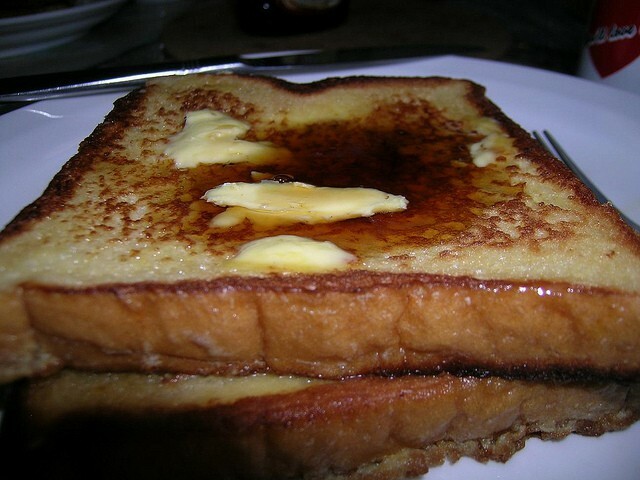 French toast is a great source for energy and protein. This recipe serves 2. In a large bowl whisk together eggs, cream, sugar, and cinnamon until blended. Soak bread slices in 1 layer for 3 minutes on one side then flip to soak other side. Heat butter in a 12-inch frying pan over moderately high heat. Carefully transfer 2 soaked bread slices to frying pan with a spatula and cook until golden brown, about 2 minutes on each side. Repeat this process with the other 2 slices of soaked bread. You can serve French toast with maple syrup, fruit or honey. 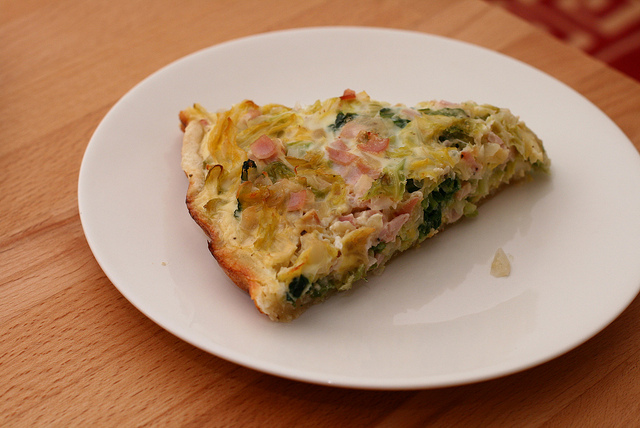 You can make this delicious recipe for breakfast, lunch or dinner. This dish includes different vegetables. You can use peas, tomatoes, onion, broccoli, celery, spinach, peppers, potatoes or pumpkin. You can choose the vegetables you desire. You can use leftover vegetables or you can chop up some vegetables and cook them. This dish serves 4 to 5. 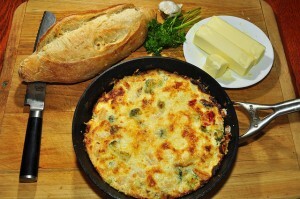 The combination of eggs and vegetables for this dish makes it a healthy delight. Make these French fries with any seasoning you like. 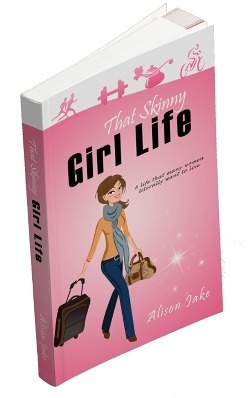 You can cut the French fries in any size you like such as thin or chunky. You can make the French fries with seasoning or leave the seasoning off and just dip the fries in ketchup. This recipe includes seasoning but you can choose whatever seasonings that satisfy your taste buds. This recipe serves 4. Preheat oven to 400 F. place aluminum foil on an oven tray and coat it with a non-stick cooking spray. Wash the potatoes off and stick holes in the potatoes with a fork. Microwave potatoes on high until they are tender but not soft for 8 to 10 minutes. Cut the potatoes length wise into the desire size you want. Place the fries on the tray and brush them with the vegetable oil. 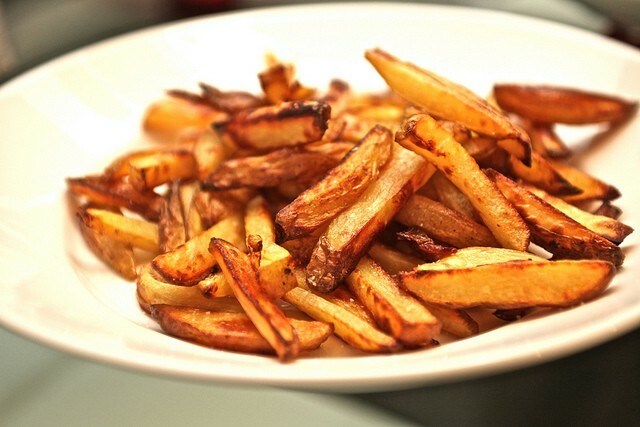 Sprinkle the fries with the seasonings and bake on the top oven shelf for 45 minutes or until they are crispy. Serve. This yummy, nutritious, and thick drink can be for breakfast, desert, or a snack. 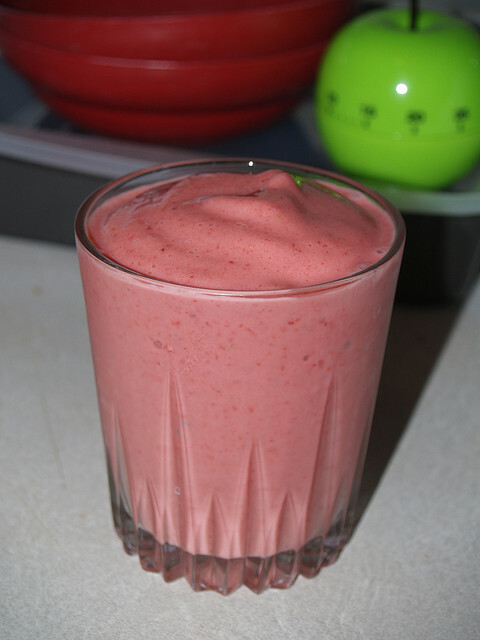 To get the best flavor for this drink choose very ripe strawberries. For this recipe you can use different fruits, such as pineapples, bananas, or berries. It’s best to drink this recipe as soon as you make it. Wash strawberries and remove stalks. Add the strawberries, milk, yogurt, sugar, and cinnamon to a blender. Place lid on blender and blend ingredients until well blended. Pour the strawberry yogurt drink into two glasses and serve. 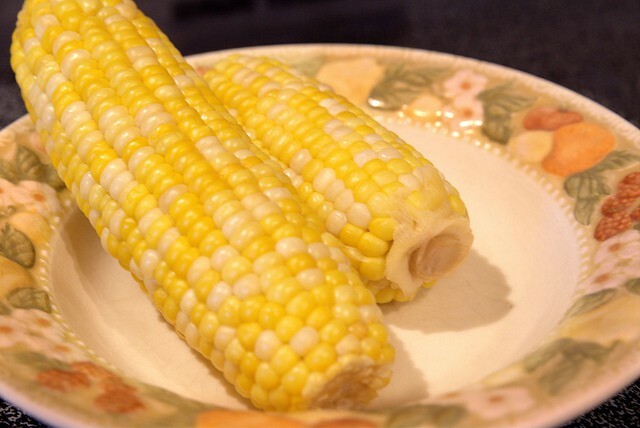 Corn on the cob is a favorite in many American Households. There are different ways in which people cook corn on the cob. We will show two different ways to cook corn on the cob. The method to cooking corn is very simple. 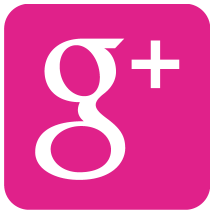 Give it a try when you want something yummy and simple to cook. If you want to boil corn on the cob, first pull off the husk and silk. Fill a sauce pan with water and bring to a boil. Place the corn in the boiling water for about ten minutes. After the corn is cooked drain water out the pot. Corn should be ready to eat. To microwave corn on the cob, first carefully pull open a few of the leaves and remove the silk. After you remove the silk, close up the leaves around the corn. Microwave corn on high for 5 to 7 minutes until corn is nice and tender. Enjoy. To season or flavor the corn you might want to spread some butter on it and season it with a little sprinkle of seasoned salt or season the water that you boil the corn in. 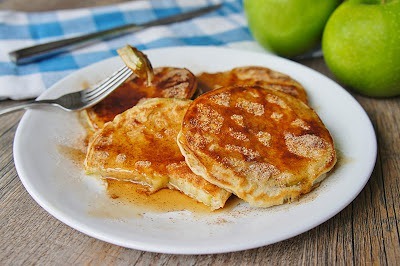 These pancakes are very delicious; and I mean appley delicious. Any fruit can be used for these pancakes such as strawberry, banana, pear, or peaches. You can use canned fruit if you like. This recipe makes two pancakes and is best served hot. I bet you can’t wait to cook these pancakes up and enjoy the goodness. Mix both flours together in a large mixing bowl. In a smaller bowl mix the egg, honey, cinnamon, and milk. Make a hole in the flour mixture and then pour the egg mixture inside the flour mixture. Mix well to make a smooth batter. Peel the skin off the apple, remove the seeds and core, and cut the apple into small pieces. Add the apple pieces to the mixture and mix well. Heat the oil in a frying pan. Pour some of the mixture in the frying pan to make a pancake. Cook pancake until the bottom is golden brown. Flip the pancake to cook the other side. Set the cooked pancake aside and repeat with the remaining mixture. Serve pancakes hot. The vegetables in this recipe make this dish colorful and healthy. This recipe can be made with any meat, but we will be using chicken for the recipe. The meat you can try can be fish, shrimp, beef, and etc. This recipe is great for dinner. Left-overs will make a good lunch. The aroma of vegetables combined with the chicken will have your mouth-watering before you eat your very first spoon full. Cut chicken into small chunks. Place chicken in a bowl and add soy sauce and ginger. Chop broccoli into small pieces or florets. Slice the mushrooms, chop the onion, and cut the pepper into thin strips. 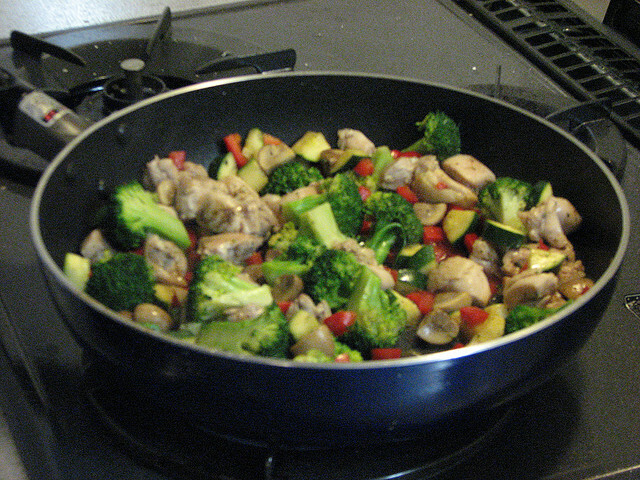 Place the cut up broccoli, red pepper, onion, and mushrooms in a separate bowl. In another bowl mix the corn starch with the water until its smooth. Heat up oil in a wok or frying pan and add the chicken and sauce mixture. Cook chicken until its almost done. Turn the heat up and add all the vegetables and stir for about 2 to 3 minutes. Pour the corn starch mixture into the stir fry and cook until the sauce thickens. Serve this dish hot. We have a wonderful dish for the veggie lovers and that dish is veggie bread. We don’t call this dish veggie bread for nothing. It has a combination of onion, zucchini, and parsley. This is a healthy recipe you can make for your family and is a great way you can get your kids to eat vegetables. However this dish has meat in it as well that you will enjoy. Cut or pull the crust off the 4 slices of bread. Lightly spread margarine on each bread slice. Place the bread margarine side up in a 9 to 10 inch microwavable deep dish. Cut the chicken or turkey up into small pieces and place in a bowl. Chop the onion and zucchini into small pieces and add to bowl. Add the eggs, flour, parsley, and cheese to the bowl and mix well. Use a fork to beat the eggs in the mixture. Spoon mixture on bread and cover dish with plastic wrap. Place the dish in the microwave and microwave on medium high for 8 minutes. Serve hot or cold. 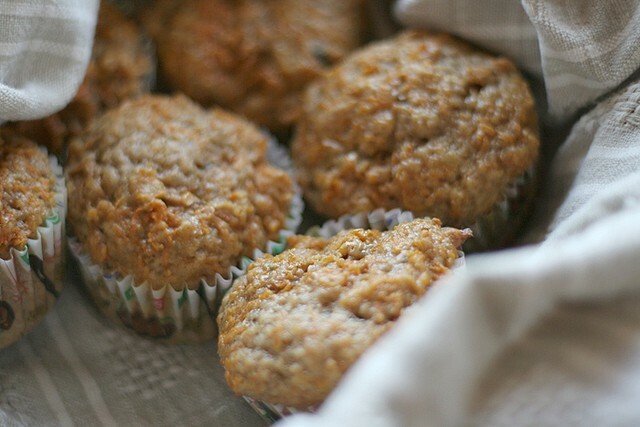 These carrot cake muffins are healthy and delicious. You can eat them for breakfast, with lunch or for snack. This recipe makes 12 mouth-watering muffins. You can serve these muffins warm or cold, whichever you or your guest prefer is just fine. You can even add whatever sweet spices you like to this recipe to make it your own. However we think cinnamon and a little nutmeg works wonders on these muffins alone. Preheat oven to 390f and grease muffin tray with spray. Combine in a large bowl the flours, baking soda, cinnamon, and nutmeg. Add the grated carrots to the flour mixture. Add brown sugar and walnuts to the flour mixture. In a separate bowl beat the eggs, milk, and oil together. Add the egg mixture to the flour mixture. Mix the ingredients until they are well combined. Spoon the mixture into the muffin pan. Bake the muffins on the top oven shelf for 20 minutes or until they are cooked. Serve warm or cold. If you love potato chips and you love healthy foods, then you’ll love this tasty and crunchy snack that is a healthy alternative to fried potato chips. You can buy kale chips in the grocery or health food store or you can make these delicious snacks yourself with your own flavor. Once you make these kale chips, share them with your family and let everyone know about healthy kale chips. Preheat oven to 250 degrees. Slice the kale leaves in half, lengthwise. Make sure you remove center ribs and stems. Place kale in a medium bowl and toss it with 1 Tablespoon olive oil. 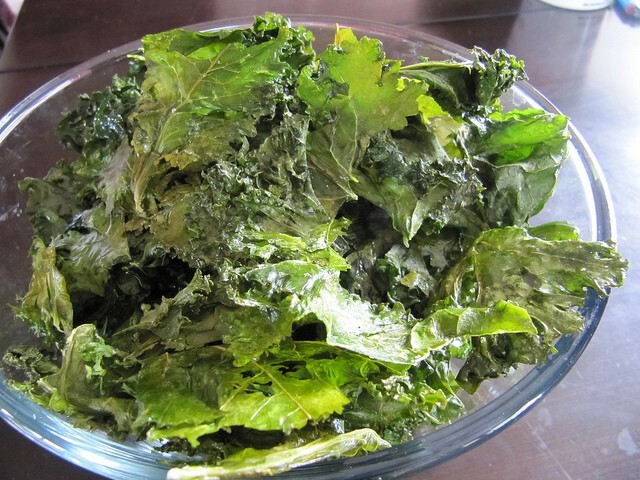 Place kale on baking sheet and sprinkle to taste with seasoned salt. Bake the kale for 20 minutes or until kale is crispy.